Baby name predictions are endlessly fascinating. 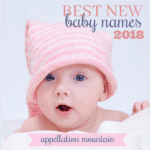 Which letters and sounds and pop culture influences will change the way we name our children? In my 2015 predictions, I added a list of specific names to watch, and yesterday, we took a look at how well my crystal-ball gazing turned out. Now it’s time for Trendwatch 2016. We’re looking for names that are not currently in the US Top 1000, but might have the momentum to get there in 2016. When I report back on Trendwatch 2016 sometime next December, any name that rises is considered a hit, even if it doesn’t quite break into the Top 1000. My score for 2015 was 13/15 for boys, and 12/15 for girls. Let’s see if we can do better in 2016! Fox – In the mid-1990s, The X-Files was a small screen sensation. David Duchovny played FBI Special Agent Fox Mulder, a believer in all things inexplicable, with plot lines involving alien abduction and the occult. While the name started to rise, it would have been a truly unusual pick back then – we hadn’t embraced animal names, and our affection for boys’ names ending in x was just beginning. This one made the 2015 list, too, but it’s back on Trendwatch 2016 because I’m thinking that surely it will tip into the Top 1000 in the coming year. Wilder – As with Fox, I’m bringing Wilder back from last year’s list for Trendwatch 2016. The numbers on this preppy hellraiser name suggest that it may have stalled out. 126 boys were named Wilder in 2013, and just 128 in 2014 – hardly an increase at all! But Wilde and Wilder have continued to feature in high profile birth announcements, and were much-discussed during Kim Kardashian’s pregnancy – so I think there’s still a chance that this name will catch on next year. Cairo – We love place names, and the advantage of Cairo is that it manages to be ancient while feeling completely modern. It’s the last of the 2015 names returning for Trendwatch 2016. While it’s seen sparing use since way back in 1979, I think next year will be Cairo’s year to make the Top 1000 for the first time. Harris – Now, on to the new! For as long as I can remember, I’ve found myself thinking wait, what – THAT name isn’t in the US Top 1000?! So it was with Harris. Harrison, Harvey, and Harold are, and they’re all rising fast. Americans have never embraced Harry as the English have, but we do adore Henry. And yet Harris was given to just 176 boys in 2014. Three reasons I think Harris could make the Top 1000 next year? First, it’s been steadily rising over the last few years. Second, we’re all about ‘s’ ending names for boys lately. And lastly, Harris was most popular in the 1920s – one hundred years ago, always a signal that name might be ready for revival. Denver – This is the second place name on the list, but Denver and Cairo seem like they belong to distinctly different families. If Cairo is all about the ancient world, bold and exotic, Denver is down-home. The name saw some increased use thanks to musician John Denver – who so famously sang “Rocky Mountain High” about Colorado, of which the city of Denver is the capital. This puts Denver in the same category as Lennon and Marley. But it also makes it feel like a rugged, outdoorsy name. Throw in the stylish letter ‘v’ and it’s no surprise this name is trending upwards. Harlem – Our third and final place name takes us in yet another direction. Named after Haarlem in the Netherlands, the New York City has gone from Dutch settlement to the epicenter of the Harlem Renaissance, an outpouring of creativity in the African American community that produced some of the most enduring writers and musicians of the twentieth century. 197 boys were named Harlem in 2014, just the tiniest bit below the threshold needed to chart in the Top 1000 – 205 births. Achilles – It’s an ancient name, an A name, and a strong one, too. The original Achilles was a great hero of the Trojan War, a warrior with only one weakness. Brad Pitt’s portrayal of the soldier in 2004’s Troy boosted the name for the first time, though I think the movie’s influence has faded. IAs of 2014, 169 boys were given the on-trend name. Creed – Creed has the feel of a modern virtue word name. 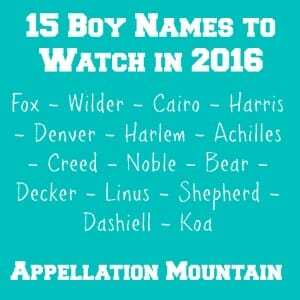 If you’d named your son Creed a few years ago, the character from The Office might have seemed an unlikely source of inspiration for a child’s name. But now, with the latest installment in the Rocky franchise titled Creed – about the son of Rocky’s historic rival, Apollo Creed – it seems a more likely choice. Noble – Here’s another big word name that I keep hearing. Noble might be a lot to live up to – but so are names like Legend, Titan, and Ace. In the company of such braggadocio names for boys, Noble feels almost restrained. 129 boys were given the name in 2014. Another point in favor of Noble’s rise? Way back in the 1910s and 20s, Noble enjoyed modest popularity – so just like Harris, a century of obscurity may have made this name feel fresh once more. Bear – What is it about animal names? For years, they were nicknames – like Paul “Bear” Bryant. But lately, they’re fair game for the birth certificate. Maybe some of it is parents’ tendency to skip the formal name. Maybe we’re so used to nature names that Bear isn’t any more outlandish than Willow or Wren. Or could this be down to Hollywood, where babies have names like Bear Blu (Alicia Silverstone’s son) and Bear Blaze (Kate Winslet’s youngest). Whatever the reasons, 129 boys were given the name in 2014 – a new high! Decker – We love a surname name, especially one ending in ‘r’. But while some of them are preppy – like Carter – others are tough-guy names. And Decker? Is a tough guy name, the sort of surname you’d choose for an action hero. 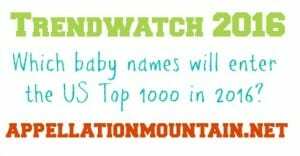 179 boys were given the name in 2014, just a smidge below the number of births needed to launch this name into the Top 1000. A Furious 7 bad guy answered to Deckard in 2015, which might also boost all Deck- names. Linus – It’s a saintly name for a son, though most parents will probably think first of The Peanuts character. Matt Damon and Humphrey Bogart have also worn the name in wildly successful movies – Damon in the Ocean’s Eleven movies, and Bogart in Sabrina. It’s also an overlooked gem that’s finally attracting more attention. 163 boys were named Linus in 2014, a new record. Shepherd – Shepherd is an interesting name. It’s occupational, but more obviously so than Miller, Carter, or Clark. And thanks to the images of shepherds so heavily associated with Christianity, it carries a spiritual vibe, too. Shepard is another spelling, but it’s Shepherd that was given to 157 boys in 2014, suggesting that this name is headed for the US Top 1000. Dashiell – This literary surname name has been gaining in use since the 1980s. When Disney-Pixar’s The Incredibles included a young character named Dashiell “Dash” Parr, I thought this name would finally catch on. And it did, but not nearly enough to crack the US Top 1000. As of 2014, there were 123 boys named Dashiell born in the US, actually down a bit from the name’s peak in 2010 of 146 newborns Dashiells. Still, I think Dashiell is very much an on-trend name with potential galore. One more reason to think Dashiell’s year might be coming? Just Dash broke into the US Top 1000 in 2014. Koa – The first time I saw Koa, I thought it was a creative spin on Noah. (It was spelled Koah with an h, so maybe it was.) But Koa is actually a Hawaiian nature name, so it fits in with Kai, too. 110 boys were named Koa in 2014, and while it’s been steady at around that number for a few years, I think it’s worth putting Koa on Trendwatch 2016. 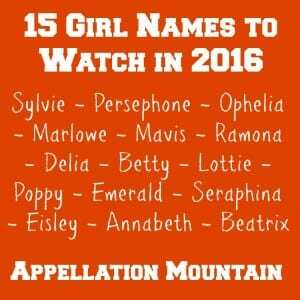 Sylvie – As with the boys’ list, I’m keeping a few of the 2015 names around for Trendwatch 2016. First up? Sylvie. Part-Sophie, part-Ava, Sylvie manages to feel like a traditional choice and a surprising, modern one at the same time. In 2014, it took 262 births for a name to crack the US Top 1000 for girls. There were 226 girls named Sylvie. I think we’ll see this name in the US Top 1000 next year. Persephone – Another name that returns for Trendwatch 2016 is Persephone. 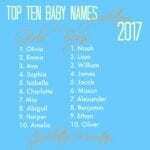 Our affection for Greek girls’ names has taken Chloe, Zoe, and Penelope into the US Top 1000, and has names like Daphne and Phoebe on the rise, too. At four syllables, Persephone will appeal to some of the Zoe/Chloe fans, but also parents drawn to names like Isabella. 199 girls were given the name in 2014. Ophelia – We love girls’ names ending in -ia, and especially girls’ names ending in -lia. Amelia is the frontrunner, but Natalia, Emilia, Cecilia, Talia, and Dahlia were all up in 2014. Cordelia returned to the US Top 1000. So why not Ophelia? It’s a substitute for mega-popular Olivia. Yes, the character from Shakespeare is tragic, but somehow that doesn’t feel like a dealbreaker anymore. Dave Grohl named his third daughter Ophelia last year, a sister for Violet and Harper. Given the Grohl family’s tendency to pick trending names, that’s a reason to watch Ophelia on its own. But the numbers are there, too – 225 girls were named Ophelia in 2014, not far from the 262 threshold to crack the Top 1000. Marlowe – Marlowe – and to a lesser extent, Marlo – has been attracting attention over the last few years. It’s been all over high profile birth announcements, and it’s just one-letter away from another surname favorite, Harlow. 203 girls were given then name in 2014, and the chatter about Marlowe in 2015 was considerable. I think we could see this name debut in next year’s stats. Mavis – Here’s a surprise. When I updated this name in anticipation of the Hotel Transylvania 2 premiere this October, I realized that Mavis has been quietly trending upwards, almost certainly thanks to the young, Selena Gomez-voiced vampire in the movies. The original Hotel Transylvania came out in 2012, when 43 girls were given the name. By 2014? That number was 231. Is Mavis the next Mabel? I think it could be. Ramona – When Maggie Gyllenhaal and Peter Sarsgaard welcomed daughter Ramona back in 2006, I started watching the name. It’s as storybook as Eloise, a name seldom heard in the 1990s or early 2000s. But ever since the high-profile birth announcement, Ramona has been trending upwards, with 233 baby girls given the name in 2014. Delia – The second ends-in-lia name on this list, but the first of an interesting kind of name. Delia was in the US Top 1000 every year through 1993, and most years through 2007. At 216 births in 2014, it’s not far from that threshold. Can our affection for Dahlia and renewed interest in Cordelia lead to Delia’s return? Maybe … I think it’s worth watching. Betty – Mad Men was influential in so many ways, but it didn’t have a big impact on baby names. A mere 75 girls were named Joan in 2014. And Betty left the Top 1000 way back in 1996. So why am I watching Betty twenty years later? Not every pop culture name is an instant hit. Some creep back slowly. When Mad Men debuted in 2007, there were 134 girls named Betty. By 2014, there were 190 newborns given the name. Sure, there may be more Elizabeths called Betty, too. But given parents’ tendency to skip the formal name, I think just-Betty could be ready for a comeback. Lottie – Just as Delia could follow Cordelia into the rankings, I suspect that the mega-success of Charlotte could result in many more baby Lotties. I think Lottie is slightly more Sadie than Princess Charlotte – but Sadie names are still going strong, too. The trouble with putting Lottie on Namewatch 2016? The numbers aren’t there. 67 girls were given the name in 2014, up from 47 in 2013. So it’s unlikely we’ll see this name in the Top 1000 soon – but I think we’ll see it trending upwards. Poppy – Poppy had a big year in 2015, appearing in two high profile birth announcements. Nate Berkus gave the name to his daughter. So did Jenna Bush Hager. A long-time favorite in the UK, this floral name has never quite caught on in the US. But this year, I think the numbers are there. 180 girls were given the name in 2013, and 244 in 2014. That’s a massive increase from a mere six newborns in 2000! Emerald – A few years ago, Emerald would have struck me as too much name. But now? It’s an alternative for Ruby, or possibly Pearl. And given our ongoing love of Em- names, from Emily to Emerson, why not Emerald? It’s been on the fringes for years, and 217 girls were named Emerald in 2014. One reason I think it might be successful now? Literary-by-way-of-Disney name Esmeralda is trending, thanks in part to Eva Mendes and Ryan Gosling’s baby girl, born in September 2014. Seraphina – Like Ramona, I started watching Seraphina as soon as Jennifer Garner and Ben Affleck welcomed their daughter in 2009. The name was given to 88 girls in 2009, and 175 girls in 2014. Now there’s a character by the name in the Harry Potter prequel, Fantastic Beasts and Where to Find Them. The movie isn’t due out until the end of 2016, so maybe I’m premature in predicting this name’s rise into the Top 1000. Still, I think it’s very much worth watching. Eisley – In many ways, Eisley fits in with Denver – another musical surname name. That’s thanks to The Isley Brothers – hold the E – and their string of hits in the 1960s and 70s. Lady Antebellum’s Hillary Scott welcomed daughter Eisele in 2013. Eisele sounds just like Eisley and Isley – it’s a family surname from Scott’s grandmother. The multiple spellings muddy the numbers on this one, but Eisley emerged as a clear favorite in 2014, given to 185 girls. From Ashley to Riley to Aubrey to Hadley, it fits right in with a long string of similar surname names for girls. Annabeth – Last year, I was watching Anneliese. But the numbers didn’t follow, despite the character Annalise in How to Get Away With Murder. But look at the numbers for another compound Anna- name: Annabeth! There were 93 girls named Annabeth in 2011 and 207 in 2014. Credit to the Percy Jackson series? Maybe. Kristen Chenoweth played a character by the name in the last few seasons of The West Wing. Or maybe it’s the success of Annabelle encouraging parents to consider the just-slightly-different Annabeth, combined with our growing interest in the ‘th’ sound, evidenced by the rise of Thea and Ruth. Beatrix – Here’s a surprise! Beatrice ranked #601 in 2014, but Beatrix? Despite the x, and the literary appeal of Miss Potter, Beatrix has only appeared in the US Top 1000 once, way back in 1883! The numbers aren’t solid on this one, either. In 2003, there were 205 girls named Beatrix; in 2014, just 175. Still, I think this name could be powerfully appealing and definitely deserves a spot on this list. What do you think of the Trendwatch 2016 names? Are there any that you can see catching on? 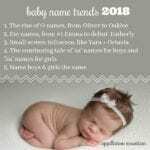 Would you consider using any of these names for your own child? dang it! my daughter is Serafina born in 2014. i thought i was giving her something she would never meet another of (or once or twice in a lifetime). now the FB movie andYA book Serafina and the Black Cloak. I cant win for trying! I’d love to see Linus get more use! Sylvie and Seraphina/Serafina are both personal faves. Is Zelie too faith-specific to make its mark on the stats? Also Oscar and Teresa for upcoming canonizations? Oscar and Teresa are definitely two to watch, but they’re both in the current US Top 1000. For this list, I forced myself to stick to outside of the Top 1000, because it’s harder! 🙂 I thought about Zelie, but only 25 girls were given the name in 2014, so even a big bump probably wouldn’t take it into the Top 1000. It’s worth watching for future years, though. After all, once a name hits the Top 1000, it tends to get more attention – so rising names have a greater chance of continuing to rise. Or so goes my completely unsubstantiated theory! I dont get the appeal of Linus at all, sounds like a disease. I don’t see Harris catching on, given that is how some people pronounce harass. I love Bear, but as a nickname for Edward. Noble and Wilder seem almost certain to go up. I’m rooting for Linus, too. I’d add Otis to the list, too. I think it is hitting the top 1000 this year. I’m watching Amos, Alfred, and Magnus, thinking they are on fast upward swings. I was so excited to see the high profile uses of Poppy this year. My husband won’t consider it, because of its link to opium, which is a total bummer. Agree it is destined for top 1000. I think this is the year for Louise. I also think Mena is hitting the list this year. I’m intrigued by your choice of Betty. I’d love to see it. Betty seems more current than Gloria, which charts in the 500s. I’d add Sailor to the list of making the top 1000. Agree with Mavis. I think marlowe is more of a boy’s name because of the playwright Christopher marlowe and because it sounds close to Marlon. The girls’ list is gorgeous, but it has me worried that my taste is more on trend than I thought! Not yet my pretties! Fantastic Beasts and Where to Find Them is not a Harry Potter prequel. This implies that it ties into the plot of the Harry Potter series. It does not. Fantastic Beasts is a separate story set in the same universe as Harry Potter.